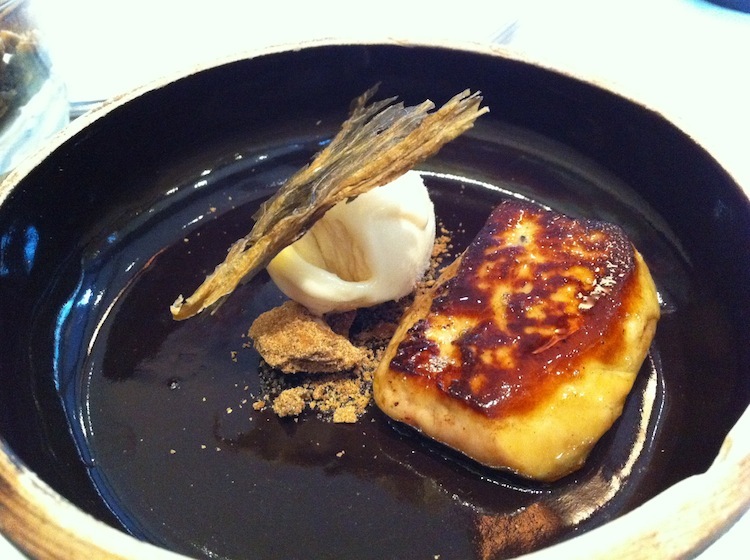 The Frenchman's Food & Wine Blog: Bo Innovation, Wan Chai, Hong Kong – utterly sublime! 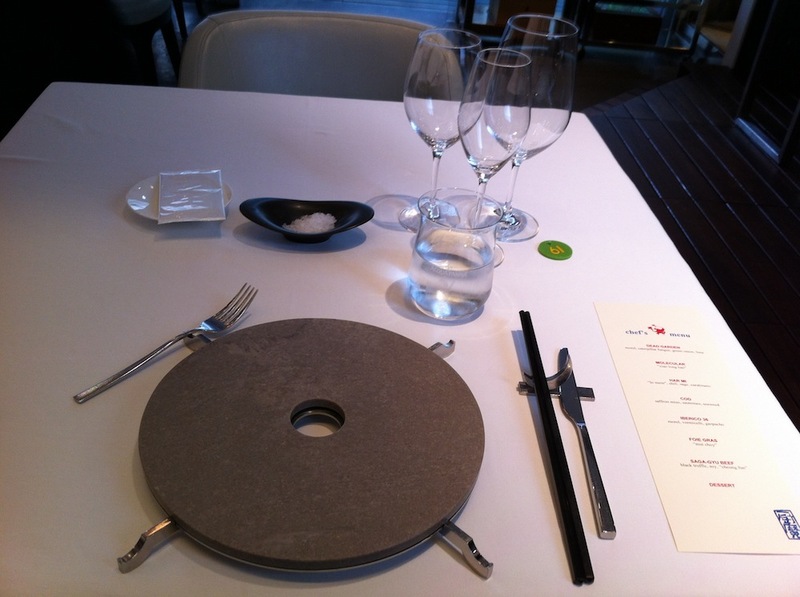 Bo Innovation, Wan Chai, Hong Kong – utterly sublime! Earlier this year, I experienced the most truly and utterly sublime meal of my life while in Hong Kong for some business recently. For many years, this place of honour on the mantle of my culinary experience was comfortable held by Cheong Liew's legendary Four Dances of the Sea, which has over the years inspired many menu offerings in top end restaurants throughout Australia, with some barely disguised emulations (although none of them come anywhere close to the original). The fact that I enjoyed this meal during lunchtime in between meetings (okay, so I was very late to the next meeting …) while dining on my own should speak volumes about the culinary tour de force delivered by the Demon Chef. 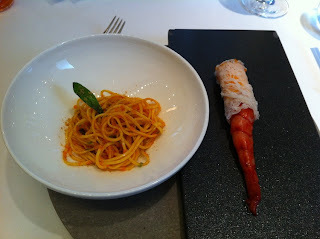 I must warn you that this article is really long, but it was necessary to do justice to the meal and the experience! I have to confess that I hadn’t heard of Bo Innovation before my trip, but my old-school mate Wu Xi (who works for one of those too big to fail investment banks in their Hong Kong office which is again enjoying record profits, so he should know), knowing that I enjoyed my food, suggested that I check it out. 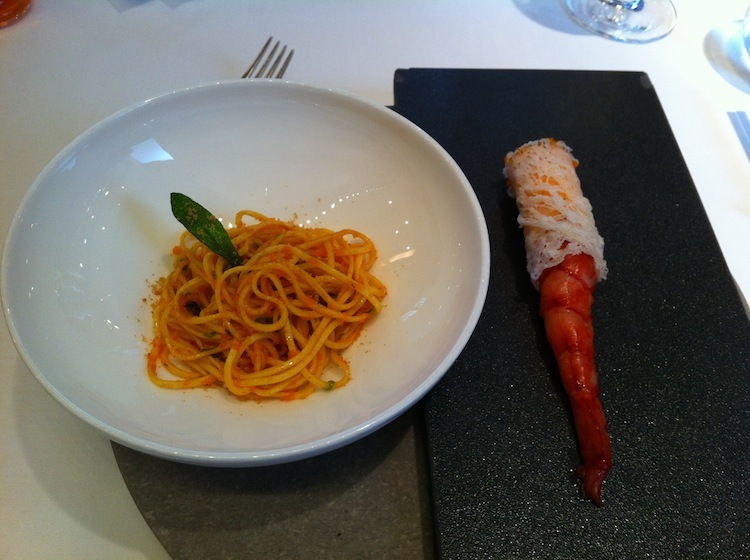 I was later to discover that Bo Innovation boasted 2 Michelin Stars, was ranked 52 in San Pellegrino’s World’s Best Restaurants 2012 list (up from 65th position the year before), and has been featured by Anthony Bourdain as well. No wonder it’s so damn good! It’s a good thing I decided to come here for lunch, instead of dinner, because it’s apparently booked out for weeks for dinner, but they were able to fit me in for an early lunch, which suited me just fine. 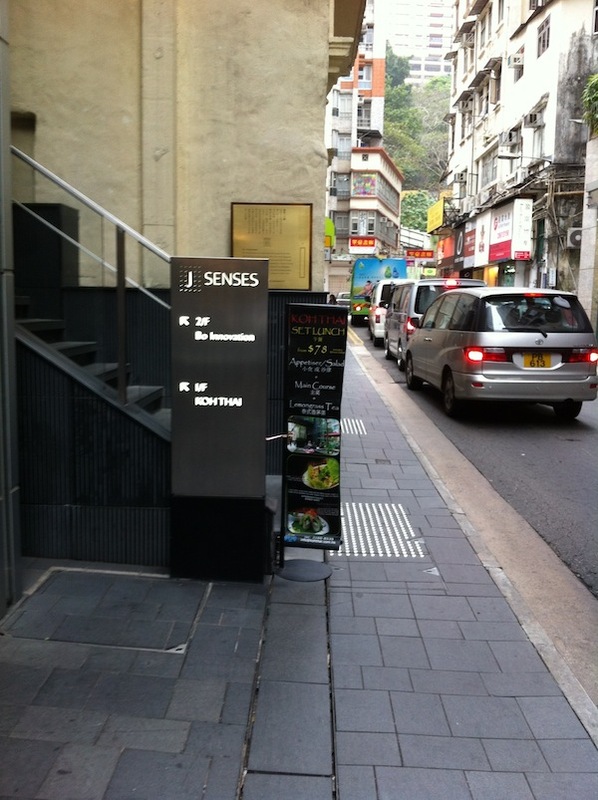 The restaurant itself is occupies the 2nd floor of what appears to be a high end apartment block in a non-descript laneway (60 Johnston Road) in Wan Chai on Hong Kong Island, with some floors having been converted into offices or restaurants. 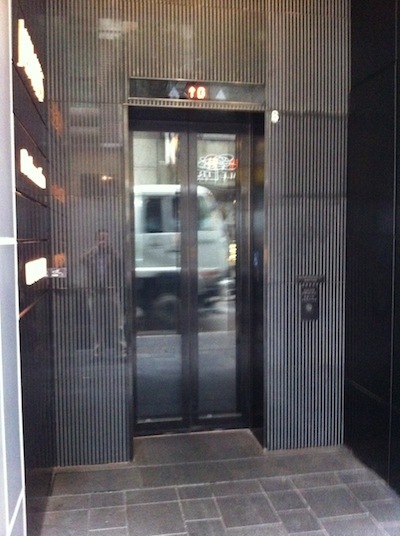 As I stepped out of the lift, the Maître D was there to greet me, but more intriguingly, I immediately savoured the rich aroma of a good Cuban cigar permeating the large terrace outside the restaurant. Yes, I was going to like this place! The source of the cigar was this lone, hard to miss, fellow with almost shoulder-length hair wearing a stylised black chef’s outfit, furiously scribbling away on a notepad. I was later to discover that this was none other than Alvin Leung, the Demon Chef and owner of the restaurant, and he was working on some concepts for his upcoming cooking TV series. 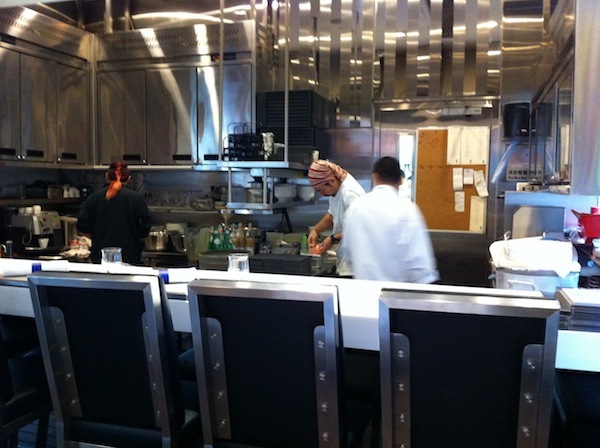 The restaurant itself is ultra-modern in design, with an open kitchen separated from the dining area by a high bar table where patrons could sit. I was pleased, however, to be given a normal table near the kitchen from which I could see the entire restaurant. The fact that I was the only one in the restaurant because of my early booking time suited me just fine. On sitting down, the first thing I noticed is the unique table setting, accompanied by different glasses to accommodate the different varieties of wine that were on offer. Naturally, I ordered the 8 course Chef’s Menu (at HK780, it’s a bargain compared to Perth prices, where you can pay considerably more for a mediocre meal), together with a glass of Bollinger to kick things off. First course was the exquisitely delicate Dead Garden, featuring morel, caterpillar fungus, green onion and lime. 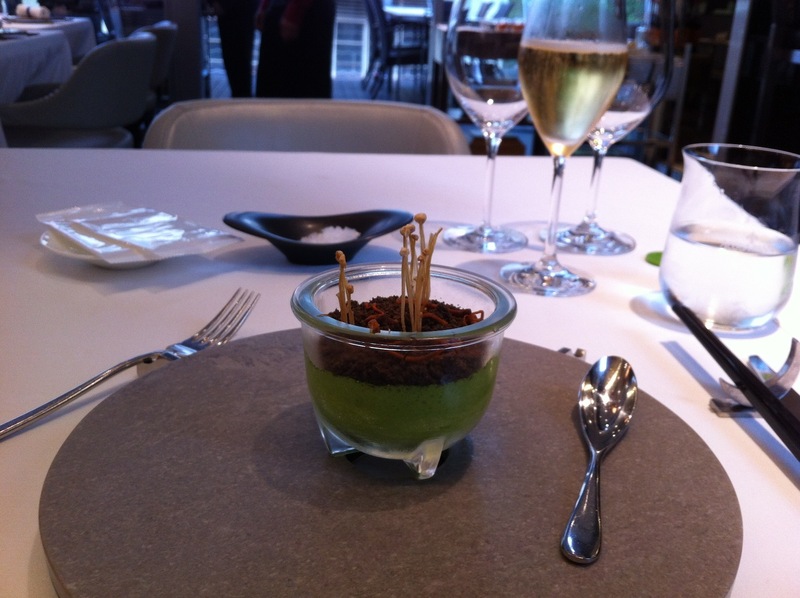 It arrived in a little glass bowl on perched on 3 legs, with the air dried morel “soil” sitting on a green foam base of spring onion and lime juice, with a generous serving of the caterpillar fungus and enoki mushrooms delicately emerging from the soil. The “soil” sported delightfully crunchy fine grains, and the enoki was infused with a savoury onion flavour that had an amazing length of flavour long after I had swallowed it. Next up was the Molecular Xiao Long Bao, arriving as a glistening, perfectly round globe garnished with a slice of pickled ginger sitting in a Chinese spoon. As I am a fan of the traditional Xiao Long Bao (a ubiquitous dim sum staple, although seldom done well), this was something to look forward to! The crunchy yet yielding texture of algae jelly shell gave way to the warm, unctuous and savoury pork flavoured soup (which was thicker than expected) in a juxtaposition of textures. 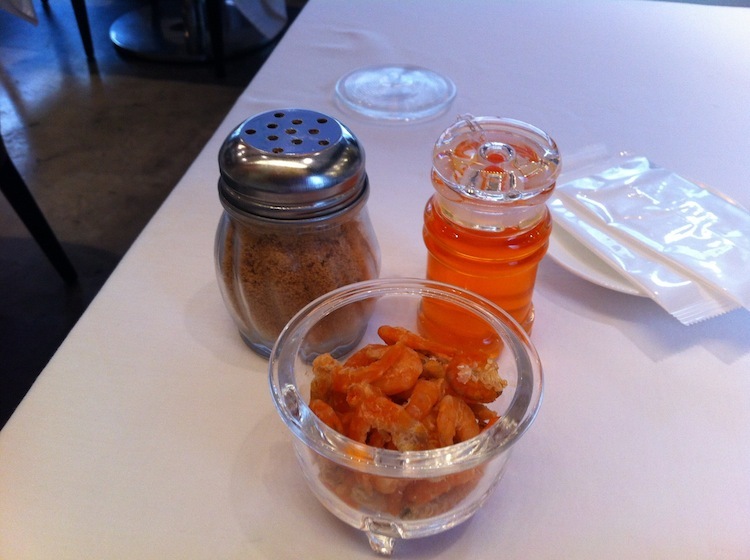 Then came the Har Mi, consisting of the namesake dried shrimp paste made into powdered flakes and oil served in separate containers, accompanied by a two-parter: handmade pasta sautéed in har mi oil and garnished with deep fried sage, tossed through with crab roe and chilli; and a carabinero (a large red prawn from Spain), half of which was sashimi style, and the other half stuffed with cream made from prawn roe and covered with crab roe. I love the fact that this dish required a little but of diner involvement – you could season it with the har mi flakes and oil to taste. The sashimi was soft but firm as you bit in, yet without any overpowering prawny or fishy flavour, and the pasta was firm and chewy but not undercooked – al dente, certamente! 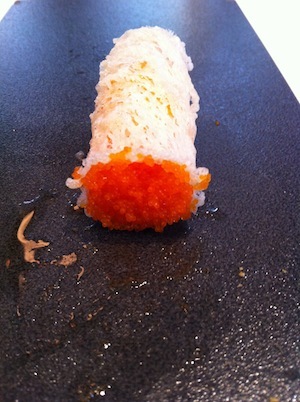 – with the counterpoint of the roe delicately popping in my mouth as I chewed. Adding the oil and flakes to the pasta imparted it with savoury prawny flavours, with the deep fried sage adding a salty, herbaceous, yet subtle counterpoint. And it even got better – I popped the remaining middle of the prawn into my mouth, where the two parts joined together, and it provided a further textural contrast from the sensuous slipperiness of the sashimi side. I could not help but linger a long time over this course, trying every single permutation of shrimp oil, shrimp flakes and each component of the dish. That’s why you know I’m not talking through my shrimp-hole when I recommend that you eat the prawn with the oil, as it further enhances the already mind-boggling yet pleasurable flavours of this dish. At this stage, the restaurant started to fill up – an eclectic mixture of business people entertaining clients, couples having a romantic lunch and even tourists on a food pilgrimage. This was also the point at which the next course arrived, a chunk of moist, juicy cod piece (somehow that doesn’t quite sound right …) delicately balanced on two cubes of sauternes jelly and light crunchy seaweed, swimming in a thick saffron miso sauce (but really, it was so thick that gravy might be a more appropriate descriptor). 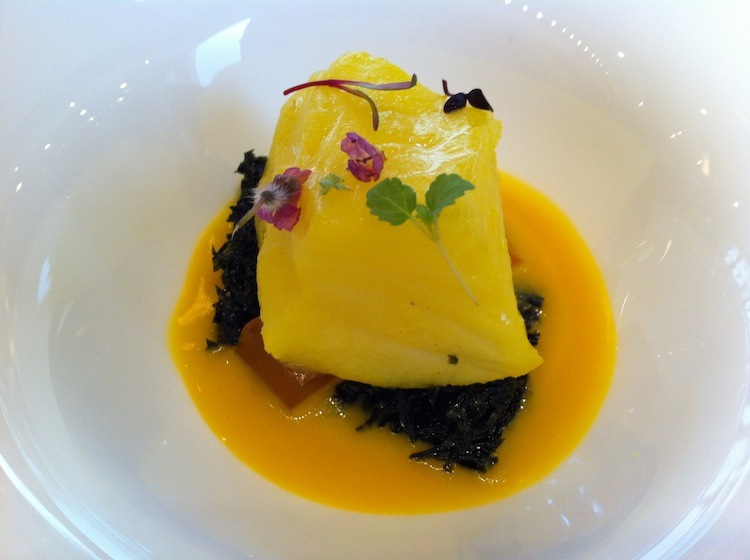 This dish exuded a comfortingly sweet and savoury aroma and the saffron miso delivered on the expectation created by its aroma, complementing the moist and soft cod and the sauternes jelly that just melted in your mouth. And there were tiny purple flowers which added just a little hint of spice – hey if it’s on my plate, I’m eating it! It’s all about the contrasts – the yin and yang – not just in the flavours, but also in the aromas, textures and the presentation. But the true skill of the master chef shines through in the fact that there is not a discordant note; all of these contrasts complement each other and blend into a superb amalgam. My glass of Tra La La Chardonnay arrived at the same time as the cod, and its fresh herbaceous and vanilla flavours nicely complemented the sweet and savoury flavours of the dish. But of course, one glass of wine is not enough, so I also ordered a glass of 2004 Chateau Tour de Mirambeau, a deliciously rich Bordeaux, all dark cherries, spice and oak. The tannins were still strong but no longer dominant, which is good, because I was here to eat. 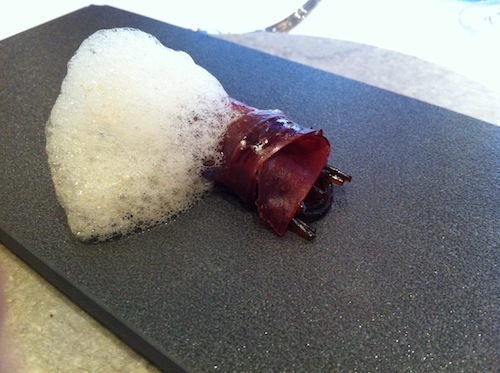 Next up came the Iberico 36 – an intriguing dish of dark-brown morel infused vermicelli wrapped with air dried iberico jamon with a blob of gazpacho foam at one end. Nice aroma and flavour, and surprisingly, it paired perfectly with the chardonnay rather than the Bordeaux. Some food for thought! Then followed a dish containing one of my favourite (albeit guilty) pleasures: a generously massive slab of fried foie gras sporting a nicely browned, slightly crispy surface. It was accompanied by a crispy wafer thin mui choy perched on a scoop of mui choy flavoured ice cream (which was strangely pleasant yet savoury), accompanied by a small chunk of ginger crumble. This dished introduced a new dimension of yin and yang: hot and cold. 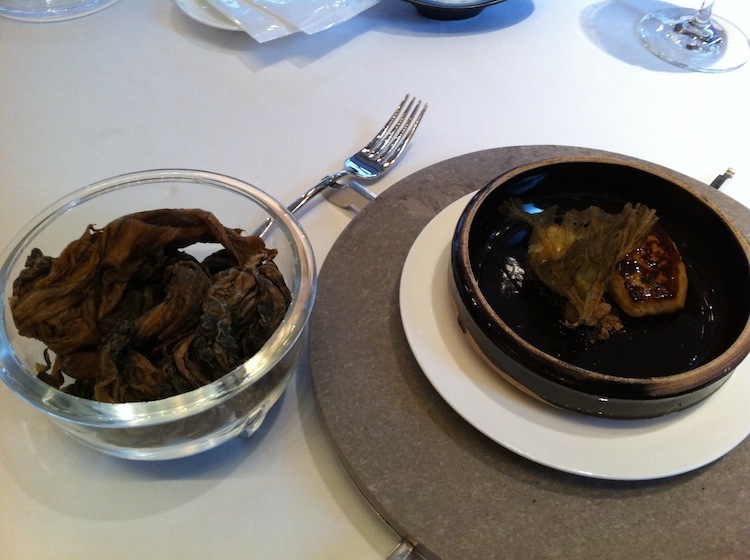 The other star of this dish was the mui choy: dried and salted mustard greens; a traditional Chinese ingredient. A bowl of dried, uncooked mui choy was placed on the table for comparison – not to be eaten, but to serve as a visual counterpoint. The sensations in my mouth of melting cold ice cream, leading into the soft buttery foie gras with its slightly crunchy fried surface, and ending with the crispy dried mui choy and crunchy ginger crumble (which had a very subtle ginger flavour – not overpowering at all) all provided a perfectly seamless spectrum of textures and sensations. I lingered over the foie gras to make it last as long as I could, but alas, all good things must come to an end. But luckily for me, the best dish was yet to come! The Saga-Gyu Beef is mind-blowing. 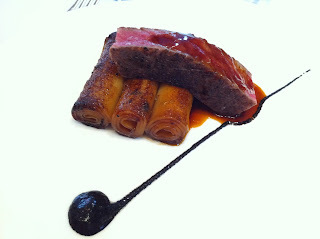 A thick slice of A4 Grade (marbling factor of 9) full-blooded wagyu lying on top of 3 short flour rolls of cheong fun, which is traditional Chinese fare most commonly eaten at a dim sum (also known as yum cha in Australia) restaurant, and certainly unexpected in a fine dining restaurant! 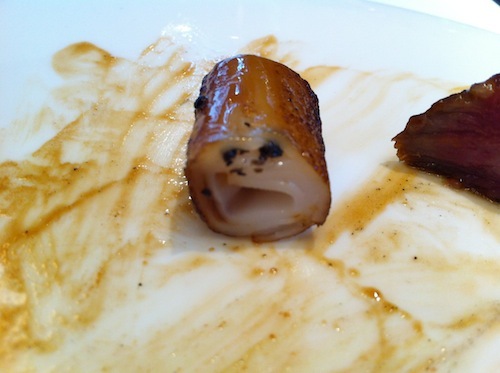 But wait, there’s more: each cheong fun roll was decadently filled with shavings of black truffle and fried in soy to impart flavour, colour and a slightly crisp texture. The dish was accompanied by a flourish of thick sauce looking like a musical note, made from white truffle oil, black truffles (you could see chunks of them poking out) and a soy reduction, as is expected as an accompaniment to cheong fun. It was salty and slightly sweet, but the flavour was not so strong as to dominate. The flavour and aroma of truffles is palpable and the cheong fun is perfect – a familiar friend (yes I love yum cha and always order cheong fun) in a different guise, offering up cruchy little truffle surprises as you chew. I expected a difference in texture between the cheong fun and the wagyu, but the revelation was instead in the similarity of textures! 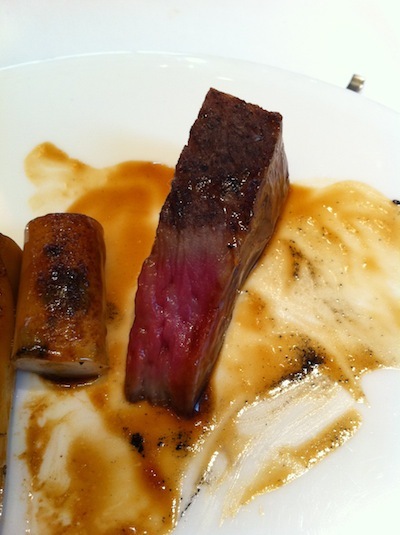 The wagyu was perfectly cooked with with a lovely dark pink middle layer sandwiched between crisp seared surfaces. The soft, buttery meat yielded delightfully flavoursome oil as I chewed into it, and reduced to a faint texture of fibres – no dentures needed to eat this meat! My mouth still salivates months later as I write this article and recall the flavours, sensations and even emotions. Wow. After this dish, nothing else could come close, so I thought the dessert was very thoughtfully created – rather than try to hit the heady heights of culinary bliss delivered by the Saga-Gyu Beef, it gave you that pleasant afterglow which you get at the end of an amazing holiday when it’s time to get on the plane to go home. But make no mistake – it was still inventive and delicious in its own right. Sze Chuan style strawberry ice cream it was, sitting on a sprinkling of toffee powder and topped with powdered white chocolate, with a few little green leaf things for a colour contrast. Being a massive chilli eater (have you read about my love of Akabanga? ), my desensitised palate didn’t experience any spiciness, but it did leave a bit of an afterglow in the mouth – more minty than spicy, really. 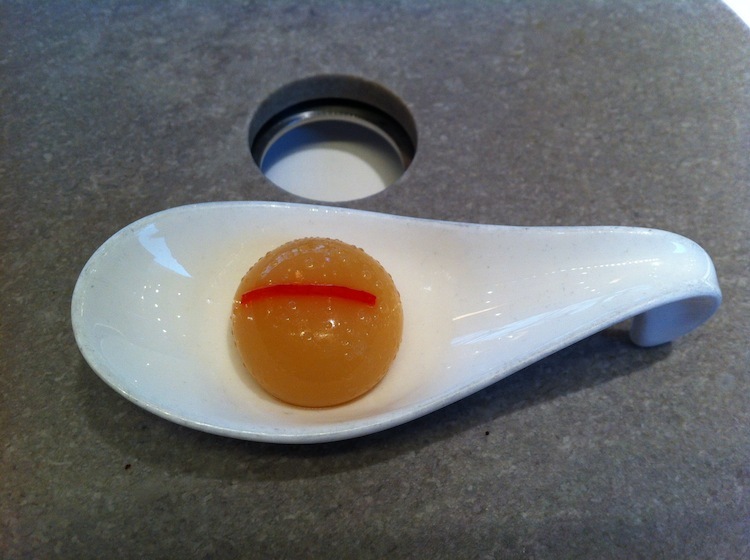 The accompanying Chinese almond panacotta (inspired by another ubiquitous and much-loved dim sum dish) was topped with blood orange jelly. 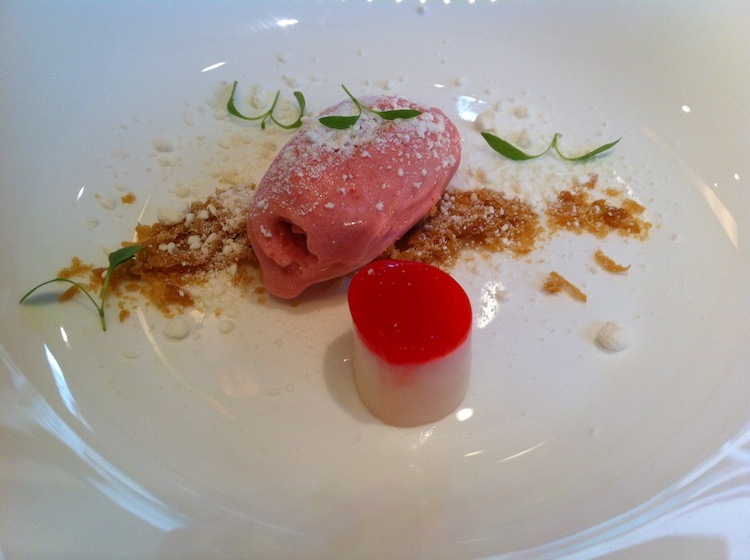 This dish was not just dessert for the mouth – its visually pleasing presentation also provided eye-candy. Now you think that this story abruptly ends here, and yes it has possibly been the longest article I have ever written, but we’re not quite done yet!